Remember when I talked about "Anchoring Balance" a few months ago? Well, I have been pushing myself to the limits, in a good way. I have almost, sort of, kind of, found that balance in my life. After I wrote that post, it really hit home on how I was spinning out of control. My stress level was at it's peak. I was stretching myself to be there for everyone and everything. Um, it's just not possible. I am a mom, wife, daughter, sister, friend and blogger....that's a whole lot of peeps in my world. I thought I could stay connected with each aspect in my life on a daily basis. I felt like I HAD to stay connected. If not, I was failing as a person, neglecting people and things that mean the world to me. Helllllllo???? McFly? We are human beings; not super heroes, even though I'd like to pretend I am Wonder Woman (see yesterday's post). After hours of reflection, talks with Ross, conversations with my mom and prayers, I came to the conclusion that I really could have it all....in small doses. Life doesn't have to be bananas. It can be the swaying leaves of the banana tree. Like the ones on my Wallis top. I couldn't resist this analogy. Doesn't that seem more pleasant? Relaxing? Calming? Here are my conclusions of trying to figure out a happy medium in our crazy, hectic lives. 1. It's okay for me to say no. Whether it's been social, professional, family/friend oriented or philanthropic. I have learned that people aren't going to be mad at me and I don't have to feel like I am missing out if I don't attend a certain something. 2. Ross and I have taken take time for each other. Alone. No kids. No friends. Just us. It's really helped us to reconnect and talk intimately without any interruptions. 3. I stepped back from trying to respond to every comment, email or request that relates to blogging. At the end of the day, I started this blog for me. I have been blessed enough for it to turn into a part time job and a fun hobby, but decided that it will not ever be a full time "job". 4. Take my kids on dates. Just us girls. Again, no friends or even dad. It's a perfect time for bonding and to be 100% focused on them. We also do things as a family of four, whether it's dinner, bowling, swimming or watching Duck Dynasty on the couch. We make a point to do some sort of activity at least once a week...together. 5. When I get upset, hurt or stressed, I stop and ask myself, "Will this matter in five years?" If the answer is "no", I move on and let it go. 6. I once heard in a church sermon the most perfect quote, "What other people think of me is none of my business." How true is that? I had to stop worrying about being judged or trying to be something I am not. The people close to me know who I am and I cannot worry about the perspectives others believe to be true about my life. 7. I embrace my time with friends. I am lucky enough to have different sets of social circles. It can be hard to figure out how to keep our relationships active because we are all so busy. I have made it a goal to stay in contact with the majority of them at least once a month, even if it's just a quick dinner, phone chat or text message. Life would be empty without my ladies. 8. Spending quality time alone was something I wasn't doing enough of. I was either with my kids, with Ross, with Ross and the kids, playing with friends/family or blogging. I started to hang out with myself more. Whether it was a half day of window shopping, getting a pedicure, sitting on the back porch after everyone was asleep or simply seeing a movie alone. It's good for the soul. It builds independence, confidence and is a good reminder that being by yourself is absolutely okay. I probably could keep my list running, but I know I only have your attention for a little bit longer. In a nutshell, the past several months have been eye opening. I have made a conscious effort to balance out my life and I have noticed a world of difference in my spirit. We all want to have it all. Do it all. Keep up with the Jones', if you will. If you don't take a step back, refocus on what's important, make time for the priorities, we are all doomed for failure....at least the feeling of personal failure. What are some things that you do to keep it even keel in your world? I am sure everyone would love some added advice. I know I would. And guess, what? There is actually a show dedicated to this entire post. No, I am not starring in it, but two famous twins are. Remember Tia & Tamera from "Sister, Sister"? Yeah, back in the 90's. Well, Tia & Tamera have a new show on the Style Network documenting the same struggles you and I deal with, just on camera. Almost every woman will relate to this show and should share in the journey of the struggles we all have as women regardless of our age and season. 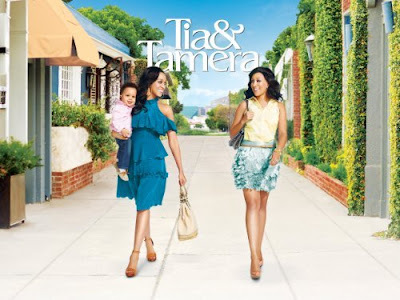 Make sure to tune in for the Tia & Tamera Season 3 premier on Sunday, July 14th at 8/7C on Style. The Style Network is offering YOU a chance to win $2,000 just by uploading a picture to Instagram. So start taking those photos and get them uploaded to Instagram. I can't wait to see who your "You & I" are. Good luck! Thank you Style Network for sponsoring this post. All opinions and content are 100% my own. Great post girl and I love this classy look!! I struggle with balancing it all EVERY day. Which is why I am up at almost midnight working on blog stuff. It is my only REAL "me" time. I feel ya sister! Small doses is really the key to everything! I couldn't agree more, we all have a lot going on, especially you and you have to take time for yourself!!! Great post, and I love you top and shoes. I'm already a big fan of Tia and Tamera. Love this outfit as well!! This is all so true. I love the banana leaf analogy! And your gorgeous hair! I love the top! You look perfect and summery, but you could be going ot work some place corporate in this! Time along to yourself! Amen to that! That's the only way I can stay sane. I need quiet, peaceful time to hear my own thoughts. I"m SO happy your have found balance in your life! I'm the same way...I want to be everywhere and do everything and its EXHAUSTING (and I don't have a hubby or kids!) I was just telling my friend the other day that this year is about everyone else, and she told me I need to make time for me. So I'm trying...and this post helped me see that too. Sorry for the random rant. I do LOVE this top, and your hair looks gorgeous! I love this post. We wear so many hats in life that it can be very difficult to keep it all balanced. Time out for yourself is one of the most important things I think women overlook. If you're not taking care of you, how can you take care of everyone else? And that top is gorgeous! I love the print. The whole outfit looks amazing! Such a great post Shanna, finding balance and not being stressed is so hard to do....I feel so much more relaxed now that it is summer and I am not teaching. Finding balance during the school year is hard...blogging really is almost another full time job! I am loving your hair, and that adorable top! Yes! Finding balance is SUCH A CHALLENGE For me too! And about your outfit. As always, styled PERFECTLY!!!! I loved this! I struggle daily to be the best mom, wife, friend, sister, daughter, blogger, etc and sometimes feel like I am failing at some/all of these. I am working on balancing the time I spent on all of the above and creating a system that works for me and makes me feel more balanced. P.S. Your styling in the photos are impeccable! It doesn't matter how busy I am, I know that for my own sanity I have to take a little time for myself. I need to decompress and spend quiet time with my husband! One thing I need to improve upon is saying no. First of all, you look beautiful. Your hair is looking extra fab in these pictures. And second, life is all about balance right? I'm so glad you took the time to figure out what works best for you and your family. and just like my friend Ferris Bueller once said, "Life moves pretty fast. If you don't stop and look around once in awhile, you could miss it." I have been thinking so much lately and considering writing a post about my fear of others thoughts about me. I'm praying that with this addition to my family I will let go of my worry and concern over what others think. Great post! Your hair is looking so gorg! I'm happy to hear that you have found the balance and have been able to reduce that crazy stress! Taking time for yourself to unwind is SO important. Great post girlie! I have to constantly remind myself that I can not do it all!! And that's ok! Love the tips and the outfit! I love this look, so chic and effortless! I feel the same way sometimes, just overwhelmed. It's best to take a step back, say "no" to some opportunities and focus on yourself and loved ones. Great post! I hear ya girlfriend! My key to that illusive work life balance is just let go, and don't sweat the stuff you will forget about in a week! Love Wallis prints - this top is just gorgeous!! Hope you are having a wonderful day! Your post totally resonated with me. Finding balance in my life is a constant struggle. The last couple of weeks I have been committed to only doing things that I WANT to do. it feels good. I practice most of the things you mentioned: I take time for me, I do what I can, I say no to things, I make sure my husband and I have time alone together, I don't give a crap what others think about me because that's their problem and not mine. I used to not do these things as recently as three or four years ago, and what a different life. I am much more balanced and serene now, and I love my life a lot more. I'm glad you are finding your balance. Be careful to keep it friend! Beautiful post Shanna. While I am just starting out blogging, I completely feel you. It is hard to fight the temptation to be everything at once. I have been working on saying "no" more this year (more at work). It feels great, and I find people respect me more when I do! You look SO pretty Shanna! Love your hair this way. And I'm glad you are finding ways to balance your time. I have been struggling with this lately too... stress is super high, but I think it is also just a super busy summer for me. I have been saying no more often, but it is making me feel better about life! Sounds like you have done some wonderful soul searching and come to some really good conclusions. Stick to it and you will be nice and round. Not in body; but in spirit!! : ) Luv the outfit. And omg I want to win that 2k. I'm really glad for you, Shanna! Your outfit is killer too! Love this! It was really hard for me to learn to say no to things. My husband jokes that I always come from a place of yes, and he always comes from a place of no. I say yes to EVERYTHING! It can be very overwhelming, and cause more stress than benefit! I love that top...I need to get shopping on Wallis. That blouse is beautiful Shanna! Everything from your hair to your blouse to your shoes is gorgeous! Love your style! preach, shanna!! i am right there with you, girl. <3 your heart! 2- love your hair in this pic!! 4- THANK YOU for taking time to comment/respond to my text and emails!! I heart you!! I feel your pain. And I don't have kiddos or a huge blog following! Keeping up is tough. I think you have a great game plan for balance. Good luck! What a great look! I adore that shirt! Finding balance is so hard, especially with kids, but it sounds like you're doing awesome. It was always be my motto to live a balanced life. I do find there seems to less time for everything. I honestly never realized how much work blogging was. I enjoy it and it's fun and a hobby for me but I want to make it better and I have to tell myself to stop and do other things. My me time is going to Crossfit - exercising really makes a difference in giving me an extra pep that I need. BTW - love this top and your hair looks so pretty! Your hair is gorgeous like that! Love it!!! This is such an amazing post. We've been spending so much time with friends lately and yes, it's fun, but just the other night we were out to eat and Aaron asked if I wanted to sit at the bar so we could chat with the bartender. I said "I'd much rather just talk with YOU." I also need to have intentional alone time. I've missed me. First of all, you look fabulous, and I love, and I mean LOVE that banana leaf top! And second, such wise words Shanna :) They definitely make me want to have some "me" time soon! I'm trying to take time for myself too. I have definitely learned to say no. My nickname is banana, so I need that shirt. Haha.